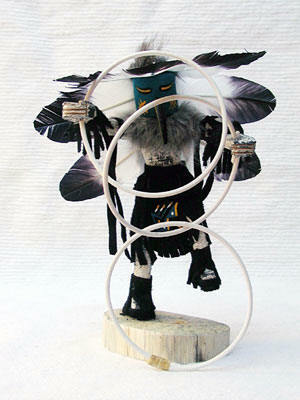 Butterfly--Butterfly directs the medicine man to ingredients that can be used in medicine. 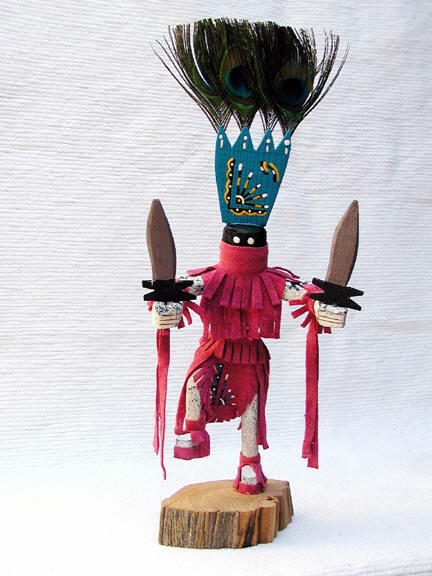 The Butterfly Kachina brings together unmarried men and women. During the butterfly social dance they appear as a pair, one female and one male. 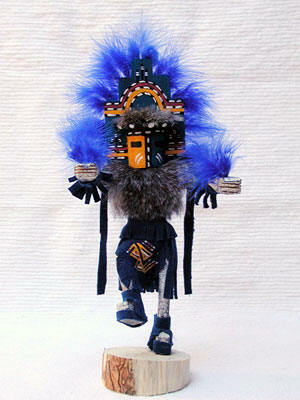 -The Sunface Kachina represents the spirit of the sun. This leader of ceremonies brings warmth, shelter for the old, a bright future, and playfulness for the young. Essential to life and growth. 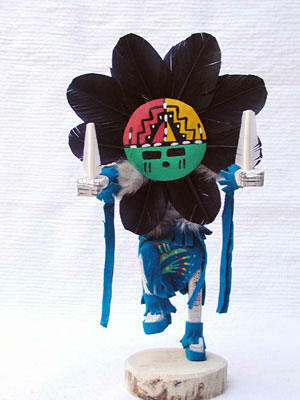 -The White Cloud Kachina represents the beauty of the clouds and brings moisture for the crops. 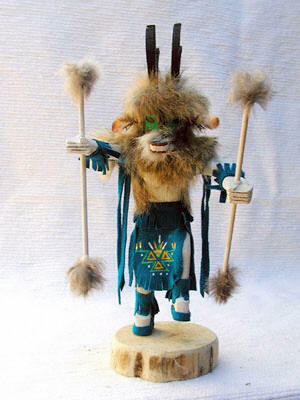 -Zuni Rain PRiest: Kachina is said to have power over the rain, but his main purpose is to accompany the Shalako during the Rain Dance. 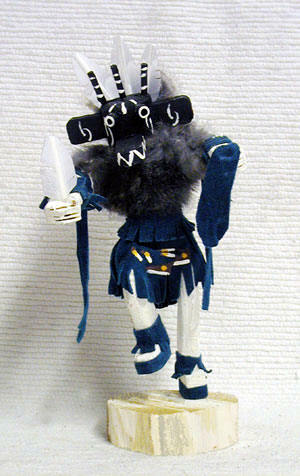 -The Mouse is not a dancer, but is a hero of the Second Mesa legend. A mouse undertook the task of ridding the village of a pesky chicken hawk. He did this by taunting the hawk and eventually tricking him into diving onto a stake. He is also known as the Warrior Mouse. 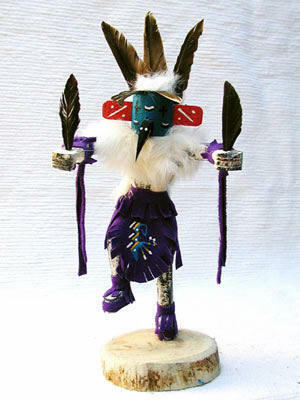 -Roadrunner: This Kachina dances for the gods to bring rain, which is essential for the growth of crops. He also protects homes by warding off witchcraft. 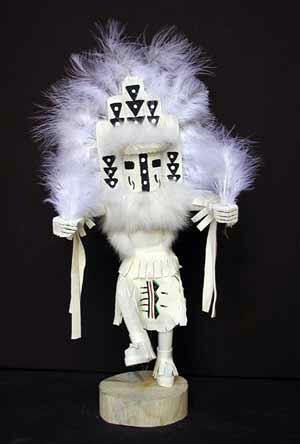 -Raven: In the beginning, Raven was first and foremost a Creator and Trickster god - especially of the Haida (Northwest Coast) tribe, who claim he discovered the first humans hiding in a clam shell and brought them berries and salmon. 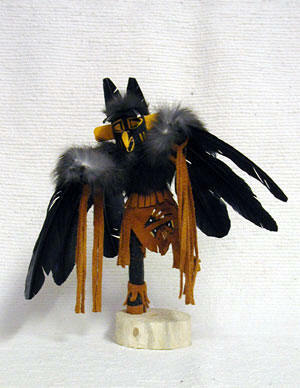 Raven is also the long-suffering victim of arch-rival in trickery, the Coyote. 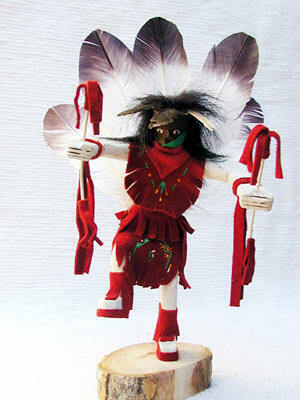 -Apache Crown The Apache Crown Dancer Kachina is also known as the Mountain Spirit Dancer. He possesses the power to heal and treats his patients by blowing away the sickness. 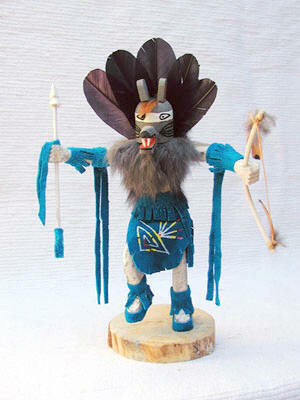 -Antelope: The Antelope is a game animal whose purpose is to dance for others of his kind. 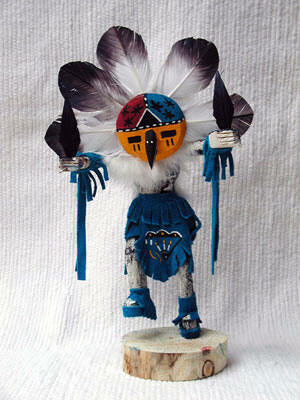 This Kachina also aids in bringing rain, making the grass grow, and ensuring there is plentiful food for the future. 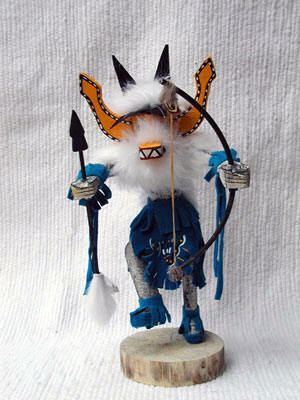 The Three Horn Kachina is a warrior who dances furiously, making pleasant and rhythmic sounds. 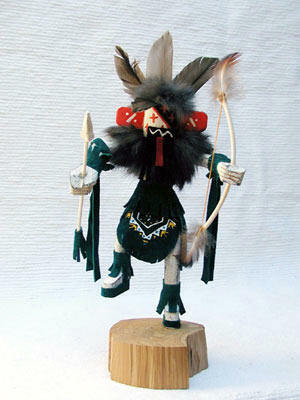 He is a guard Kachina and represents swiftness and action. 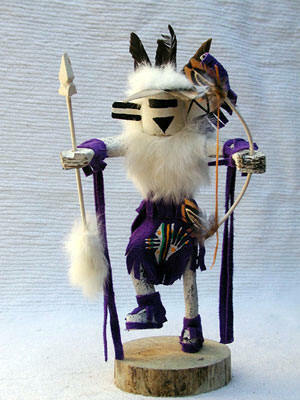 Authentic Native American Kachina Dolls: Navajo dolls are used to represent our spiritual connection. Choose from three sizes These are not manufactured in China but are the genuine article made by Navajo Native Americans, using real feather, fur, etc. Collect them all on a monthly plan. Cancel any time. Revised: 18 Feb 2012 19:38:27 -0500 .